Do readers care if an author has won an award? A writer friend of mine recently contacted me, asking if I’d entered my book for the Rita Award. The Rita is an award presented by Romance Writers of America (RWA). The award is given to romance novels in various categories. The Rita is presented during the RWA annual National Conference during the summer and authors are really excited when they final and when they win. There are also several RWA chapters that sponsor contests for published authors. Some of these chapter awards have gained quite an impressive reputation and authors are pleased when they win. The Carol Award is another well-known award in the writers’ community. The Carol Award is presented by ACFW (American Christian Fiction Authors) during their late-fall conference. Again, just like the Rita, authors are excited when they final and when they win. I’ll admit that I’ve entered several writers’ contests. I’ve never final-ed and I’ve never won, but, I wasn’t bummed out about it. When my author friend asked me about entering this year, she’d wondered if a final or a win would help with book sales. Her question had me wondering – I couldn’t answer her, because I really didn’t know! I’ve judged several contests over the years. I’ve read some AMAZING books that final-ed and/or won for these contests. But, the amazing books that I’d read, from what I can recall, were already pretty popular among readers. I’ve also discovered some new authors when I judged. So, I wondered if readers really care if an author has won an award. Are most readers even aware of the Rita or the Carol award, or any other award? I’ve never really asked readers about this, which prompted me to ask this question on this blog post. I’m thinking that a lot of readers find out about great books by word of mouth and online recommendations. I believe most just want a good story and are unaware of the awards, but, I’m not really sure about this. Just speculating. So, readers, are you impressed when an author wins an award? If so, which awards impress you? Hi Cecelia, I tend not to think about whether or not an author has won an award or not- for me, it is about whether I like the story, am in the mood for the genre, have read the author before or not. An award doesn’t hurt, but doesn’t necessarily mean I will like the book anymore than a book by an author who has not won an award. Some of my favourite stories were published by indie authors. Hi Wemble! I’m not surprised to hear that! I often wonder if readers are even AWARE of the Carol or the Rita award! It’d be interesting to see if they even know the significance of those awards. I’m thinking industry professionals/other writers tend to know about those awards moreso than readers! It depends on the award. I check out the RITA finalists in the Religious/Inspirational category, and I definitely follow other industry awards such as the Inspy, Carol, and Christy Awards, or the CALEB Award (for Australian and New Zealand Christian writing – have to support the home team!). But there are other awards I don’t rate at all, either because I don’t enjoy that style of fiction (*cough* The Booker Prize *cough*), or because they have so many categories that everyone who enters is a finalist (naming no names, but any contest with 100+ categories looks dodgy to me). Hi, Iola! I forgot to mention the Christy Award in my blog post! Shame on me! That’s another huge award! I’ve never heard of the CALEB award! I get excited when authors I love get awards. But my usual method of finding new-to-me authors is by word of mouth (or recommendations from bloggers that I follow). Hi, I’m not surprised to hear this! Hi Cecelia! As a reader, I am impressed when an author I love wins an award. An award substantiates what I already know about the author that the author is talented in her craft. I often follow RITA finalists in the Religious/Inspirational category, and Inspy, Carol, and Christy Awards. The Christy Award has special meaning because as a teen Christy by Catherine Marshall was one of the first books I purchased with my own hard owned money. A book that I read and reread. Not sure whether awards influence by buying. Best wishes. Hi, Renate! Actually, I’ve never read Christy! I do know about it’s significance and realize it’s a Christian classic. I’ll need to add it to my TBR list! For the most part it doesn’t matter to me. If the book is by an author I like or the blurb sounds interesting, I will read it. However, there have been one or two books that I made a point to read because they had won an award. Hi, Jessica! thanks so much for commenting! No I am not influenced by authors winning awards, in fact a lot of the books I read are from authors on this site. Some of my favorite authors are ones who contribute to Word Press. I will be perfectly honest, I do not pay a bit of attention to award winning books by authors I do not know…I guess I mean that it makes no difference tome. NOW, when one of my favorite authors wins an award for a book I am always so very happy that they are being recognized, since I love them so much I appreciate when other do as well!! Hi, Paula Marie! That’s great! I’m not sure how readers would know about a book being an award winner unless there is something on the book cover. As a reader, I don’t seek out award winning books. 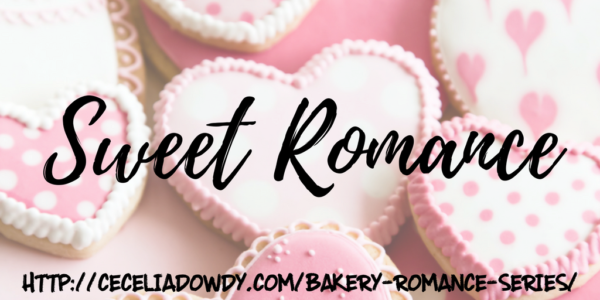 For what it’s worth, I have a book that won in Short Contemporary Romance the RWAFHL Readers Choice in 2018, and it didn’t impact sales. The real value from contests like the RWAFHL Readers Choice Award is that they’re reader-judged. Everyone who enters will have new readers in their genre discovering their book. Those judges may love the book and explore the author’s back list, or they may tell their friends about the book. I’m not particularly motivated by the idea of winning awards, but I am interested in contests that directly introduce my books to new readers. that’s a great point, Narelle! Kimberley, congrats on your contest wins! Hi, Kimberley! I’m not sure if winning the Rita would impact sales either! It’s hard to really know something like that since I’ve never won! I did enter this year! I honestly can’t recall if I’ve entered the FHL contest in the past, though! That’s not to say, of course, that there’s anything wrong with authors entering contests, and I cheer for author friends who decide to enter them and perform well or win. I just accepted a few years ago that what I appreciate about a book may not be what contest judges look for, and not all judges are created equal. I learned the latter as a contest entrant. I had some fabulous, extremely helpful feedback from judges, and I had some that was beyond horrible and made me wonder where the judge had been dug up. Great teaching experience though, on both sides. Hi, Dawn. Yes, it’s a great teaching experience from both sides! Good point! I usually choose a book by recommendation. I am excited when a favorite author makes the RITA or Christy list of nominees. I usually check which author is nominated. If I see an author I am not familiar with then I check out the book that was nominated. Hi Kerri! It’s great that you check out books that were nominated! It’s a great way to find new authors! The awards make no difference to me. If I like the blurb and/or already like the author, that’s all I worry about. Book awards do not influence me in purchasing a book. Like others have said, I’m happy for my favorite authors if they do win, but I don’t pay attention to awards when choosing a book. Like many have said I am excited for authors I know win an award but as a reader if I see awarding winning author or book on a book it doesn’t make me want to pick it up. One reason often books that win are subjective of what the judges like and not always what a reader likes. I have seen books I have read and really dislike go one and win best book etc does it mean its a bad book cos I didn’t like it no but do I think I would have given it an award over another book No I wouldn’t but others did think it was best. I do like to see author friends win an award. Hi, Jenny! Yes, it’s always great to see our author friends win awards! Like yourself, I don’t always judge a book as to whether it has won an award or not! Have a wonderful day! As an author, I like winning awards. It kind of validates what I do. I have no idea whether it increases sales with the average reader. I think it might generate some sales among other authors. I know I’ve bought books that have won awards so I can see what award-winning books have. I have found a couple of new authors whose books I love to read because they have won an award. Hi, Merrillee! Congrats on your award wins! I’ve also found new authors by the awards that they’ve won! I don’t pay attention to awards. If I see a cover or a recommendation and see that it has won an award, it might give it one more reason to take a chance on spending my time on it. But I don’t really care about awards. Hi, Lila! I sense that a number of readers don’t pay attention to awards! Have a wonderful day! I gonna go out on a limb here, and be the odd duck. While I don’t purchase a plethora of books, just cause they’ve won an award, I do follow several contests/awards. I pay attention to the Rita’s, the Carol’s, the Christy’s, and FHL Readers Choice. 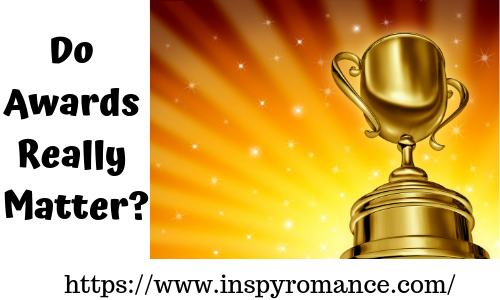 Also, in the RWR, (Romance Writers Report) I check out the Inspy category for who has won what awards. I get excited to see my author friends receive the validation of winning/finaling in contests. And while I’m not a voracious reader, I do read an average of 36 books a year. Half of which are historical Christian Romance. There have been a few times where I’ve been in a book store and had two books in front of me but only enough money for one. Most of those times I go with the book that’s won a big award. Although that doesn’t happen often, I haven’t been disappointed yet. Hi, Debby! Thanks so much for sharing your thoughts!